Charles Darwin is a much known name to everyone. He is highly respectable geologist, naturalist, biologist and author. He is been considered as one of a greatest scientist the world has seen so far. His exceptional contributions to the evolutionary theory have made him one of the most beloved scientists among science lovers. He put forth the theory that all species have descended from the common ancestors over the time. In 1859, in his book “On the Origin of Species” he published the theory of evolution with all evidence. Right from childhood he had a burning desire to contribute .He had keen interest in nature which led to passion for natural science. In Human history, Charles Darwin has achieved an honor of being one of the most influential figures. He had very revolutionary ideas. 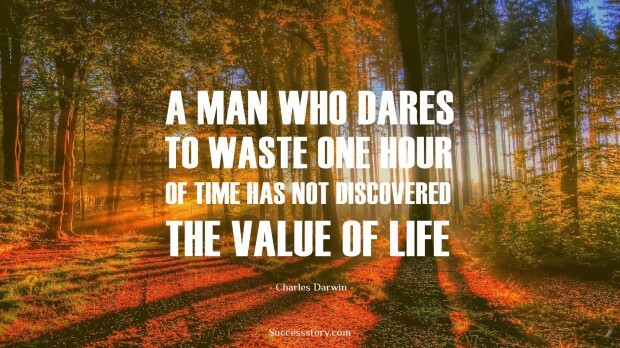 In his famous quotes on importance of time in life, he advised people to use time wisely. He asked them in the quotes to understand the value of each moment in life. He believed that the person who even waste one hour of life has really not understand the value of life. A lot can be achieved in an hour of time so it should be given due importance. He valued life that much. He was a very kind, modest and pleasant man who worked throughout his life in natural sciences. He was equally great as a considerate human. He strongly stood against slavery and ill treatment to native people. He never acted against his humanitarian principles.